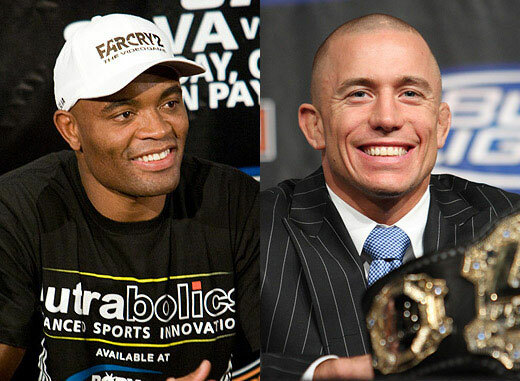 After Anderson Silva’s victory last UFC 126, media kept on asking him who’ll be his next opponent. There has been a rumor that Silva will be meeting next another top champion MMA fighter in the name of Georges St-Pierre. However, it seems that GSP is not really into this match-up. “I don’t even think about this right now. I never thought about it. I always live in the present moment, and my biggest problem is Jake Shields,” St-Pierre answered when talking about a fight with Silva. “It would be foolish for me to look past Jake Shields. He poses the biggest threat to my title. He’s a very well rounded fighter, and the UFC brought him in, and I’m glad they did because he’s the No. 1 guy for the welterweight title. On the other hand, same thing also occured during Jake Shields’ final fight at Strikeforce. The promotion matches him to Dan Henderson. However, just like GSP, Shields has a lot in mind rather than that. UFC’s big boss Dana White puts his trust on Shields. He knows that he is a champion in the making. He thinks that the GSP vs. Silva fight match-ups motivates the former Strikeforce middleweight champ. “People have been talking about this super fight between (St-Pierre and Silva) forever, and one of the things that I’ve always said is it’s a fantasy fight right now. Half of it’s over, (Silva) just beat Vitor Belfort. That was a very dangerous fight, and now Georges St-Pierre’s in a very dangerous fight up here in Canada. (Shields) is so stealth, it’s unbelievable, but that’s how he’s been his whole career,” White said on Tuesday. “Georges has to get through this fight first before we can even talk about an Anderson Silva fight,” White said. “Jake has been on this run and he’s fought at 185 pounds, too, and been dominant there. But the thing is the reason this Anderson Silva/Georges St-Pierre fight makes so much sense is because these two have been consistently fighting in the UFC, and this is more of a legacy super fight,” White explained. “People argue over who the pound-for-pound best in the world is. Is it GSP? Is it Anderson Silva? If he beats Jake Shields, (Anderson) just beat Vitor, they’ve cleaned out an entire division over the last several years and the fight makes sense.